Leeds. My husband is also an Ofsted registered assistants childminder. I am 43 years old with three children of our own, aged 14, 13 and 11 years old. I have 4 years of experience working with children in at School's in Leeds and at Church. Currently I attend Bridge Community Church where I volunteer in the children ministry. I offer excellent service in Middleton LS10 3RQ starts at 5.45 am - 8.00 pm. 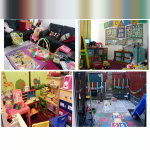 In a safe and secure environment with a wide range of toys and resources to support learning and development. Children, Parents and Carers are pleased with my services. In my home, I have various play areas that are appropriate for different ages. I also have numerous toys for children to play and learn, the living room is also used for indoor play and learning activities and teaching which include educational DVD'S, Healthy Eating, Good Hygiene, Art and crafts etc. We also use it for relaxation and movie time. I also do baking, art and craft on a regular basis. My home corner is used for pretend shopping with lots of toys for children to play with. Internet facilities is available for children to study or complete their homework form school. Records are kept of them doing activities from time to time, this is used to monitor their progress/improvement in areas needed. A file is made for each child as a proof for parents/careers to see what service is being provided . I also ensure stimulating learning and fun in a safe secure environment which encourage all round development of children in my care. - Emotional development which involves managing their feelings and behaviour. With all this facilities and activities, there is never a dull moment for the children as they are always having fun and they're developing . I have 4 years experience working with children in schools, currently working in church and home. I attend Bridge Community Church where I work in the children’s ministry as a Sunday School Teacher every 2 weeks on Sunday, where kids are taught about the Bible, respect. love and care for everyone.which I also pass on to the children i looked after. Below are the latest reviews for Victorious Kids. Please note that reviews represent the subjective opinions of other Childcare.co.uk users and not of Childcare.co.uk. Parents must carry out their own checks and references on childcare providers to ensure that they are completely happy before enaging in the use of their services. Mrs Patience has cared for my 2 sons for the past 2 years. she is very excellent at her job and creates various activities for all the children regardless of their age. I cant fault her in any way with regards to her abilities as a child minder. She provides fresh home cooked meals after school everyday and made sure each child was comfortable. She is very flexible and would always try to accommodate all the odd shifts that i worked. Thank you for being a wonderful childminder to my kids. Mrs Patience is a great child minder and has took great care of my son for the past 2years. My son has good manners and is good at writing at the age of 4. I completely trust Mrs Patience with my son and I am also happy to know that my second baby will get high quality care from a caring and rialable childminder. Patience is a God send.i would highly recommend her for Childminding.She is the best Childminder around.She is my First Experience using a childminder nd Patience made me feel very at ease. She is very reliable,kind and caring with my little Girl. My Daughter made Good progress. as a christian myself, I felt my child would be safe under her supervision. I found out I needed not worry because not only was she competent in what she did, my child was always excited to go there and I notice significant progress with my child's interest in books.